How to disable or delete a scheduled task on my Windows 7 computer? I don't want the scheduled task to run any more. If you don't want to continue run a scheduled task to keep your computer more security, you can follow this tutorial to disable or delete it. 2. Click "Task Scheduler" to run it. You see the Task Scheduler screen showing up. 4. 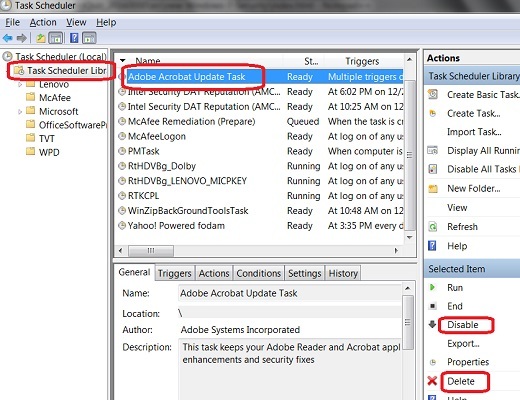 Locate and select the task you want to disable or delete. 5. Click on "Disable" or "Delete" in the bottom section of the Actions panel. The selected task will be disabled or deleted.